I was born in Medellin, Colombia but I have lived in New York City for over twenty years. I moved to San Diego to complete graduate school in the fall of 2004. While attending The Graduate Program in Visual Arts at UCSD, I have produced a body of work that is consistent with my previous work, which deals with the existential condition of emigrants from Latin America in the United States. Currently, I am making a triptych video project consisting of interconnected short videos that examine the city landscape from the perspective of rooftops in Tijuana, Mexico. I am exploring the iconicity of the city of Tijuana, as a conglomerate of memory traces of my childhood in Medellin, Colombia. The first and second installments of this triptych include the now finished Candide (10 min 2005), and The Chairs (15min 2007). Candide is an experimental narrative video about lesbian love and emigrant longing performed on a rooftop in Tijuana. The Chairs is a theatrical adaptation of Eugene Ionesco�s play. 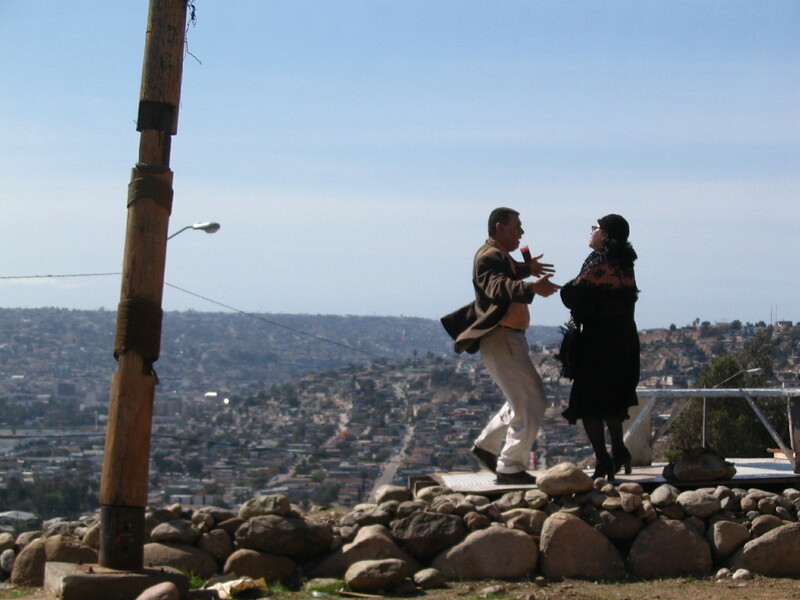 Also shot on a terrace top in Tijuana, The Chairs constructs a political critique of emigrant nostalgia in the theater of the absurd tradition. The third installment of the series is a lyrical documentary about Medellin. By superimposing memory and chance, theatricality and documentary, with the specificity of color, landscape, language and architecture I build contrasting impressionistic and expressionistic visual and aural representations of the two cities. This way, I draw attention to the elusive image of the citizen in a metaphorically, and literally, walled city and engage in issues of social displacement due to migration. My videos are a way to bridge the existential condition of not belonging from here or there toward being from here and there and to freer forms of expression.